Bhavnath is a small village in the Junagarh District of Gujarat. However, during Shivaratri festival this quaint little village is transformed into a place of intense spiritual ecstasy, which at the same time, is coupled with worldly fun and frolic. On one hand, the Mahadeva temple located in the village becomes the rallying point of sages and spiritual leaders. On the other, a five-day fair, more popularly known as Bhavnath Fair, is organized to offer entertainment to the visitors and income opportunity for the locals. There are indeed, many reasons to attend Bhavnath fair in Gujarat. Bhavanth fair is held on the occasion of Maha Shivaratri in Bhavnath, which is located at the foot of Girnar Mountains in Junagarh District. Loosely translated, the word Shivaratri denotes the Night of Lord Shiva. It always falls on the fourteenth night after the full moon in the Hindu month of Magh/ Falgun. It is said that Lord Shiva was united with his Consort Devi Parvati on this very night. According to some other legends, this is the night when Lord Shiva began his Tandava dance which almost destroyed the world. Still others believe, on this day the Lord saved the creation by consuming the poison that came up when the sea was being churned for Amrit. Whatever is the reason, Shivaratri is the most important festival for the devotees of Lord Shiva. They keep fast for the whole day and perform different rituals throughout the night. Festivals are arranged in every Shiva temple in India and abroad. It is natural that the Mahadeva Temple at the foot of Mount Girnar will have special attraction for the devotees for it is one of those places where the Lord is “Swyambhu”. It means that the deity here has not been installed, but has emerged on his own. To reach Bhavnath, you must first come to Junagarh; it is located at a distance of 8 km from the town. However, the fairground starts much earlier. Therefore, you may put up at Junagarh and visit the fair from there. Otherwise, you may put up at different dharamshalas located in near vicinity. Authorities also put up tents for the temporary accommodation of the pilgrims; you may also opt for that. As soon as the clock strikes 12 at night, one can see groups of Naga Babas descending on the fair ground. They live up in the mountains all year round and come out only during the Bhavnath Fair. Since they have renounced everything material they do not wear a single piece of cloth. That is why they are known as Naga (naked) Babas (sages). You generally see them smeared with ashes carrying traditional weapons like swords and tridents. They come in a grand procession, in the forefront of which is an idol of Lord Dattatreya carried in a grand palanquin. To the Naga Babas, he is the incarnation of Lord Shiva himself. The sages come behind the palanquin riding on decorated elephants and blowing conches. Behind the elephant troop, one can see hundreds others coming on foot, dancing and making merry all the way. Their sword fight is truly spectacular. They begin their worship with a dip into the Mrigi Kund. Mrigi Kund is a holy tank in the Bhavnath Mahadev Temple. The water in the tank is believed to contain sulphur. However, devotees believe that this tank was created when garments of Shiva and Parvati accidentally fell here. Some others believe that Lord Shiva himself took bath here. Some also claim that there is a secret tunnel leading to some undisclosed destination under this tank and only sages of highest order know about it. You may or may not want to take a dip here, but you can watch others doing so. 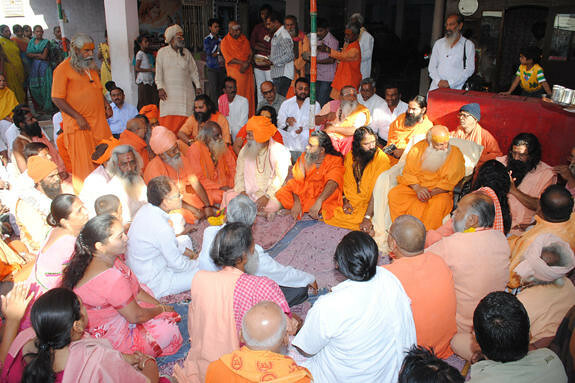 Other than Naga Babas, sages of other sects also come to Bhavnath during Shivaratri. Hundreds of people come to this fair simply to seek blessing from them. If you are lucky you may also get blessed by immortal sages, who live in Girnar Mountains in their subtle body. Wrishi Dattatreya is one among them. It is to be noted that Girnar Mountain at whose foot the Bhavnath fair is held has been the abode of Dattatreya, the incarnation of Lord Shiva. Some also take him as Brahma, Vishnu and Maheshwar incarnated in single deity. In addition, the mountain is also said to be abode of nine Nathas (Navnaths), who protect the devotees from all evils. Many sidhdhha (enlightened souls) also live in this mountain in their subtle body and unseen by the devotees they shower blessings on those who seek it. It is believed that during Shivaratri, they all become especially benevolent and shower their blessings on whoever visits the fair. Therefore, if you are in pursuit of spirituality you must visit Bhavnath fair during Shivaratri. So far we have only talked about spiritual attraction of Bhavnath Fair. However, there is also a material aspect of it. This fair, which runs for five consecutive days, has been dubbed as Mini Kumbh. Although it is held in smaller magnitude, it has all the grandeur of the actual Kumbh Melas. What is more, if you care to see, you will see a mini India unfolding before your eyes. People of all classes, castes and creeds come to this fair from far and near. They may follow different customs and speak in different languages, yet they are all Indians at heart. Therefore, if you want to know India with all her diversities you must come to Bhavnath Fair at least once. Devotees to the Bhavnath temple generally undertake 7 Km parikrama around this temple. You too can mingle with the crowd and take this parikrama. However, if you are in mood for more, you can take up trekking trips in the adjacent mountains. Also try climbing the Girnar Hill. Although it involves climbing 9999 steps there are places to take rest after every 300 meters. However, the ordeal is amply rewarded once you reach the summit. Views from the top are truly mesmerizing. Besides, the mountain also houses a number of ancient temples dedicated to different deities. Therefore, if you are spiritually minded, this is an additional bonus point you. Other than that, Damodar Kund and Sudharshan Talav are two other interesting spots near Bhavnath. These two water bodies are associated with Lord Krishna and are easily accessible. The fair ground is located adjacent to the Mahadev Temple. People of far and near come here to put up different kinds of stalls. There they sell everything from local handicrafts and jewelry to idols and rosaries. Indeed, if you are looking for good quality rudraksha mala (rosary) you must come to Bhavnath fair. In addition to these, you will find many vendors selling more mundane articles such as utensils and small furniture pieces. Many of them also sell pure Gujarati food; their smell tingle the nostril. Friendly sword matches and wrestling bouts are also a part of the celebration at Bhavnath Fair. Generally Naga Babas take part in these matches. Dramas, related to Lord Shiva and Mother Parvati, are also held in the evening. These are generally enacted by Bhavai community, known for their street performance. Apart from the dramas, they also show many other tricks. Folk songs and dances are another feature of the festivity here; they are generally performed by the country folks. In short, Bhavnath fair offers good entertainments all through these five days and the atmosphere resonates with happy notes. One more point to note that the organizers offer free meals to the visitors for the entire period and therefore you can enjoy yourself without bothering about where to eat and what to eat. Finally before you leave, take the most famous Ferris Whhel, also known as Bada Chakka and enjoy the adrenalin rush.